Typically, PR doesn’t consistently drive traffic and leads; you get a story in USA Today or the New York Post and get some good traffic, eventually it dies down and you have to repeat the whole process over and over again. You may or may not see a bump in leads after getting press. What if you could target PR activity to build traffic, traffic that exponentially increases each day? When clients come to us with a need for visibility, they don't automatically think to connect their PR strategy with their content and SEO strategy. Brad Zomick of Pipedrive wanted to do exactly that, he wanted to get traffic from press that would never die down. It’s a tall order! He was very good at writing content but he wasn’t sure how to use PR to ensure the traffic from his PR effort consistently grew without any added effort going forward. The strategy our team came up with and executed worked wonders for Pipedrive. We identified the term sales management as a high intent search term for Pipedrive. In other words, people who searched for this term converted to customers through Google Ads very well for Zomick. Pipedrive was determined to rank #1 on Google for this specific keyword, sales management. It’s a popular and competitive keyword with 20,000+ searches per month and Zomick wanted Pipedrive to rank first for for the term. We worked with Zomick to write the original piece of content for his company blog. Using the JustReachOut platform to find publications and submit guest posts that linked back to the original piece on Pipedrive’s blog, this project took about four months. The backlinks appeared in content on several publications and blogs, including the LinkedIn Sales Blog, Inc., and Fast Company. The entire process of how we used PR to rank #1 for the term is thoroughly documented on Moz.com. As we published more and more guest articles linking back to the original article and optimized the original article, our rankings improved with every day. When SalesForce (Pipedrive’s #1 competitor) referenced their sales management article in one of their blog posts it was quite a celebration at Pipedrive’s offices. 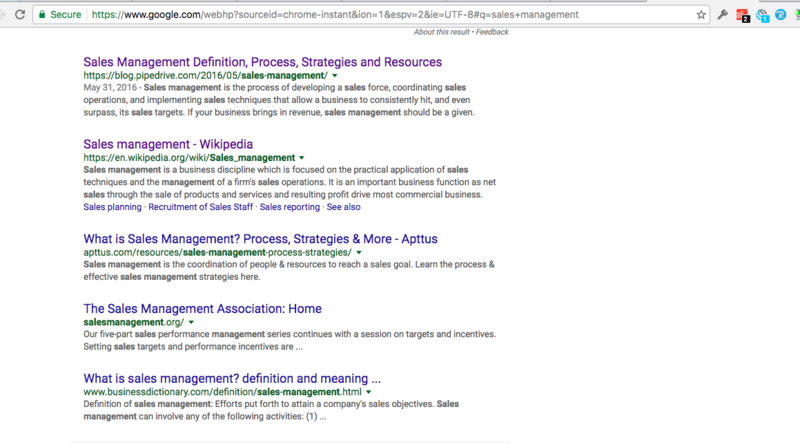 Pipedrive now outranks Wikipedia for the term sales management, taking the #1 spot on search results. The traffic on their blog post continues to generate more traffic and Pipedrive still receives hundreds of leads every few weeks from this single piece of content. Currently companies like SalesForce, Zoho, Monday.com, and Oracle are bidding on Google Ads for this search term while Pipedrive is just pulling in traffic without too much effort. This case perfectly illustrates the power of marrying your content and SEO strategy with your PR efforts.